I love a yummy smelling house. Just ask my kids friends…..every time they walk in the door they comment “your house always smells SO good”. Sometimes it’s because I’m baking, but most often it’s because I have an slight obsession with melting tarts and little air fresheners hidden all over the house. a revolutionary fragrance system that keeps your house smelling fresher, longer! 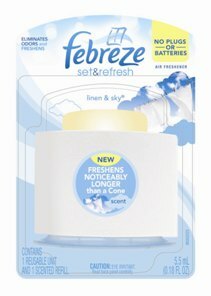 When using scented cones just isn’t enough, Febreze has got you covered with six new, long-lasting fragrances. Found in Walmart’s new Air Care aisle, Febreze Set & Refresh is the only product of its kind to slowly release the same amount of scented oils over time. With Febreze Set & Refresh in your home, you can breathe a sigh of relief that your home will smell fresh and clean for days! The scented oil comes in a small plastic cartridge that you just pop into the holder. That’s it. The scent is released automatically with no need for plugs or batteries. I have one sitting in the bathroom and another behind a picture in our bedroom. 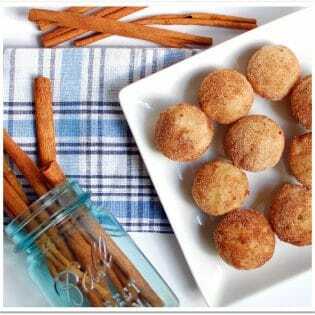 Scents include: Natural, Meadows & Rain, Linen & Sky, Floral, Fruity & Refreshing, and Exotic. Febreze wants to offer you an opportunity to test out Set and Refresh for your home. Three (yes 3!) TidyMom readers will each win a $5 giftcard to Walmart so that they can choose a scent of their choice. 1. Leave a comment, telling me what scent you think you would enjoy. Become a subscriber to TidyMom by doing one of the following: subscribe via RSS, email or Google Friends connect (see widget at bottom of page) Already subscribe? AWESOME!… but be sure to let me know in the comments so your extra entry will count. Giveaway will end on Oct 5, 2010 at 5 pm CST. Three winners with a valid entry will be selected at random using random.org. I will email the winners and they will have 48 hours to claim their prize. Love Give Aways? click over to Tip Junkie for a huge listing of Give Aways every day! Disclaimer: Febreze and My Blog Spark provided me samples of their product. I was in no other way compensated to publish this post. These are my real opinions. I like you am obssesed with my house smelling good. I’d try all of the scents except fruity or floral. those are usually too cloying. I am a subscriber via google reader. I would love to try either rain a meadows or linen and sky. I love Febreze and would love to try the exotic scent. Although I’m sure any of them would smell wonderfu. I follow on GFC and RSS feeds. I follow you and Febreze_Fresh on Twitter as BookOwner and tweeted this giveaway. I like Thai Dragon Fruit. I am a Facebook Fan (Mari Doug). Following both you and febreze and tweeted about the giveaway!